Alex & Alene’s beautiful wedding began with their ceremony in the courtyard at Liberty Station. The couple used our Hexagon Arch and our Hedge Walls as a privacy wall to create a more inclusive area. The reception featured a mix of our round and rectangular Vintage White Farm Tables. The couple got creative and reused our Hexagon Arch as a backdrop behind their sweetheart table. Carly & Nick’s Wedding at a Private Residence in Rancho Santa Fe was straight out of a fairytale! 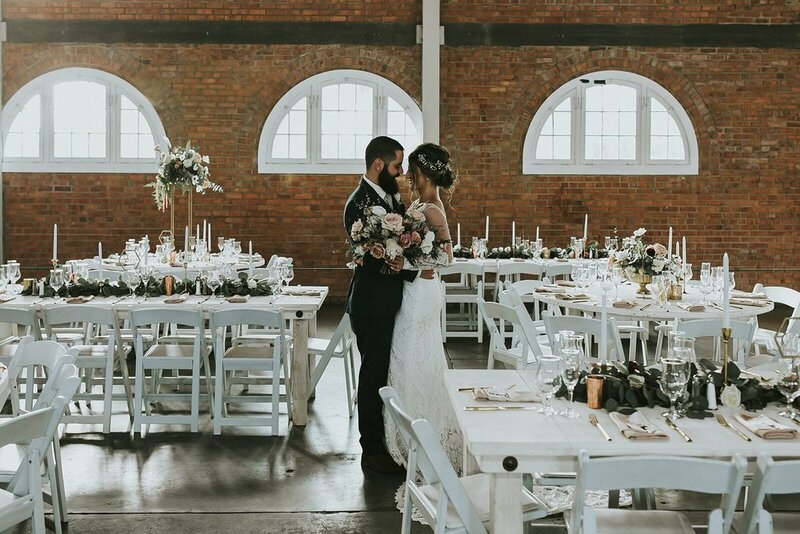 The couple used our vintage white farm tables and cross-back chairs for their reception dinner. During the cocktail hour, our 6ft vintage white wooden bar was paired with our vintage white classic arch. Before enjoying dinner, guests were welcome to relax in our emma chairs and enjoy their delectable drinks. To add an extra element of decor, the couple used our vintage white bar back shelves for display. Towards the end of the night, guests headed over to the beautiful dessert table to satisfy their sweet tooth! Lisa and Julien’s gorgeous al fresco estate wedding was one of our favorite weddings of 2018! 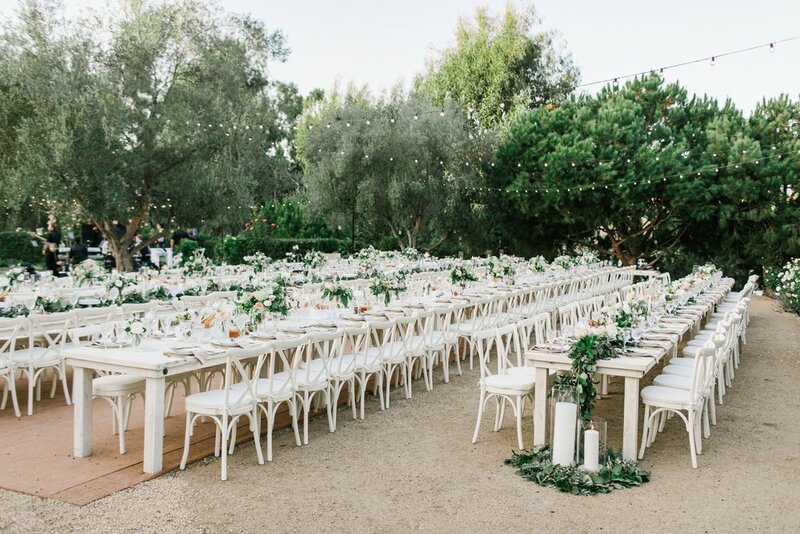 This couple wanted to keep it fresh and used our honey brown farm tables to go with their simple color palette. They couple got creative and added a single cabana over the table to hang floral chandeliers! 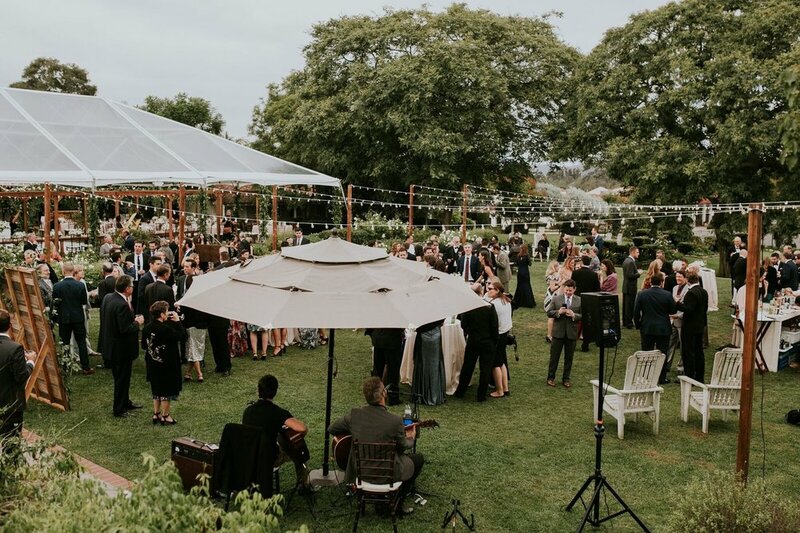 Emma and TJ’s gorgeous garden and tropic reception at Rancho Valencia was one of our favorite weddings this past fall. The couple enjoyed their first dance on our rustic wooden dance floor surrounded by their family and friends. The dining for their reception featured our honey brown cross-back chairs and our 8ft honey brown farm tables. The head table was the talk of the evening! The bridal party enjoyed the reception dinner underneath our honey brown cabanas. 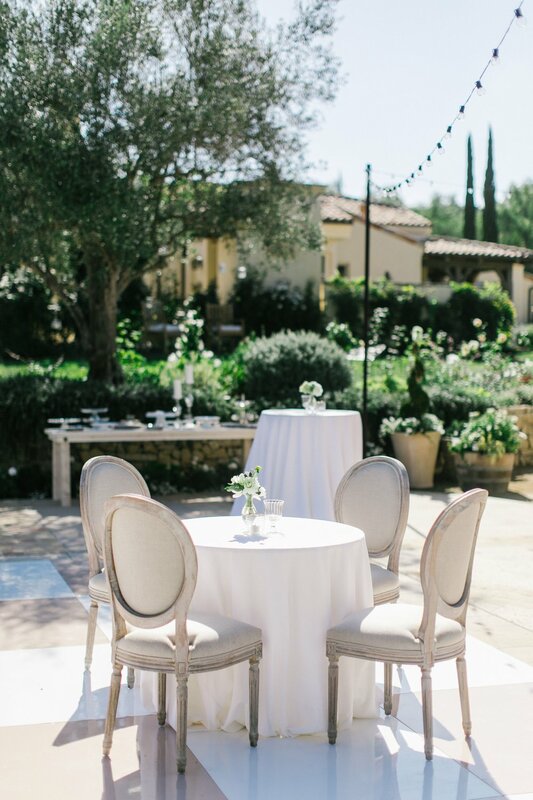 Jason & Alexa’s wedding at the Inn at Rancho Santa Fe featured some of our favorite rentals! 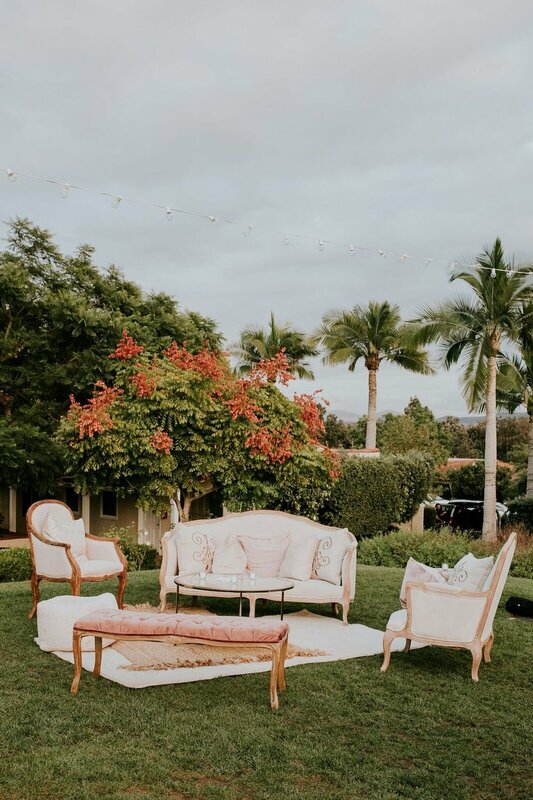 The couple added our elegant Charlotte Lounge as a seating option for their guests, along with our white string market lighting and white wooden bar. The couple used our 6ft honey brown table to display their photobooth guestbook. Their beautiful reception dinner featured out honey brown cabanas and farm tables. 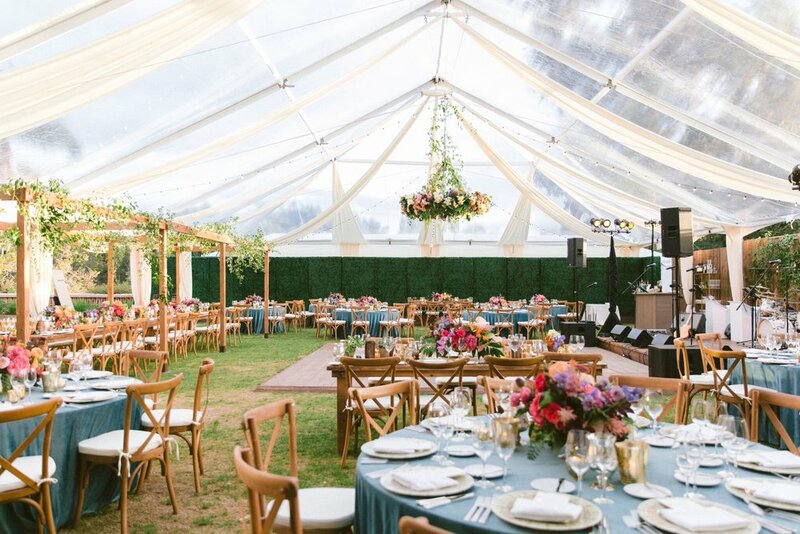 This indoor garden reception featured our honey brown farm tables and cross-back chairs. The couple also added our privacy walls to create an entrance and divide the room!